Allegorithmic has released Substance Painter 2.2, the latest update to the 3D texture painting software, adding a major new material layering feature, and improving asset search and projection painting. The release coincides with the developer’s Substance Days user event. 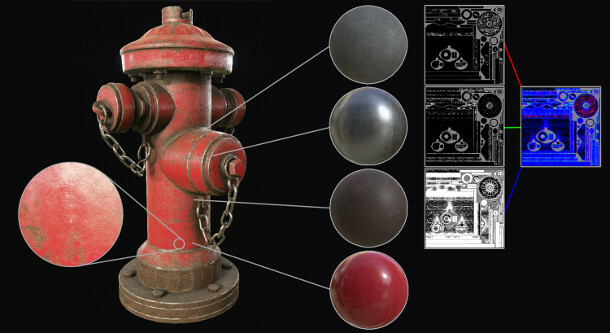 Substance Painter’s new Material Layering system enables users to visualise shaders made up from multiple source materials directly within the software, and get an accurate preview of the results in a game engine. The way in which the source materials are blended across the surface of the asset is controlled by a series of black-and-white masks, as shown in the image below. Allegorithmic has also released a free Unity plugin and Unreal Engine shader – a full UE4 plugin is “in the works” – compatible with the new workflow. The need for material layering, and the way in which the implementation within Substance Painter works, is discussed in more detail in this blog post, written while the system was still in development. Other new features in Substance Painter 2.2 include improved options for searching for assets within the shelf, including a “comprehensive list of tags” and a fuzzy search algorithm. When projection painting, users can now choose which channel is used for the projection overlay; and the scripting API has been extended to enable the texture baking process to be scripted. Substance Painter 2.2 is available now for Windows 7+, Linux and Mac OS X 10.10+.